Along with Famous Dex and Ugly God. Lil Yachty is the latest MC from Atlanta to make a sudden leap onto a larger stage. "I don’t know how it happened," Yachty's barber told him recently. "Don’t care," he added. "But I'm proud of you, boy. You scared me for a minute, but I'm proud of you." 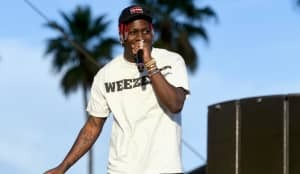 Co-signs have a way of leading to more co-signs, so it's not surprising that Yachty is popping up on other artists' records. He recently joined Famous Dex and Ugly God on DJ Carnage's "Rari." Listen below, and revisit Yachty's FADER interview.